April 20 Update: Antique Oak & Glass Display Counters, Oak 10 Drawer Map Case & and a Large Assortment of Quality Bookcases and Store Fixtures Available for Purchase! Old bookstores are best enjoyed by leisurely browsing. For this reason, we hope you can plan to spend an afternoon. We have over 75,000 volumes covering just about every subject. The bookstore resides in a historic limestone Pennsylvania Bank Barn built in 1800. 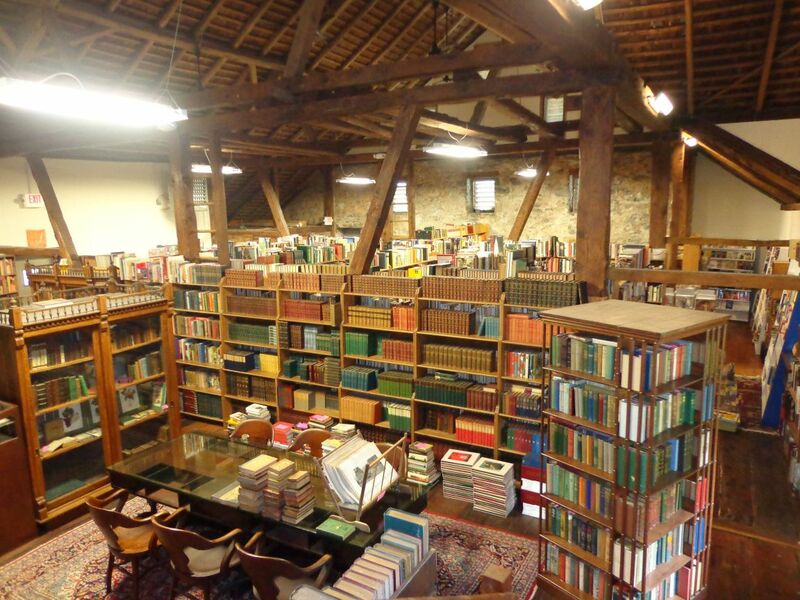 The original architectural features of the barn have been retained and highlighted, blending harmoniously with the fine selection of old and antiquarian books. Leather volumes feel at home between hand-hewn chestnut beams, 18-inch-wide oak floor planks and 2 foot thick stone walls. The barn is heated by a turn-of-the-century antique pot-bellied stove salvaged from an old railroad station. Even so, standards of heating from that era don’t quite meet modern expectations. We recommend a good sweater (and sometimes a hat or gloves) during the colder months, so that you may better enjoy your browsing. Lighter clothing is recommended during the “Dog Days” of summer, especially if you will be browsing in the loft. We close the Book Barn between Christmas Day and a date in Mid-March each year. During this time we can meet with customers by appointment. A visit to Meadowbrooke Gourds—practically in our backyard—world famous supplier of decorative gourds to the likes of Martha Stewart. Their seasonal tours should not be missed. A visit to Downtown Carlisle, a quaint traditional “mainstreet” community, home to numerous antique shops, boutiques and intimate restaurants. A walk on the Army Heritage Trail at the Army Heritage Center. Open to the public and free of charge, it features recreations of a World War I Trench System, a Revolutionary War Period Redoubt, Old Artillery Pieces and Tanks, Replicas of Old Military Barracks, etc. A walk or ride on the Cumberland Valley Rails-to-Trails Trail. The recently renovated trail runs between Newville and Shippensburg on the bed of the historic Cumberland Valley Railroad, which began hauling passengers and freight in 1837. Attend one of the world famous Carlisle Car Shows. The main shows are scheduled in the Spring and Fall and now include collector car auctions. A total of 11 car events fill out the summer schedule. And farther afield, Gettysburg National Military Park and the National Civil War Museum.